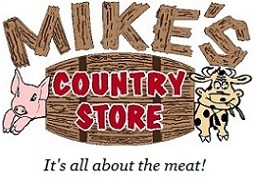 Click the button below to add the Mike's Spicy Cajun Steak Sauce - 8.5 fl oz. to your wish list. Mikes Spicy Cajun Steak Sauce - 8.5 fl oz. Serve it with any of our delicious fresh steaks online. Ingredients: Tomato Ketchup (tomato paste, high fructose corn syrup, distilled vinegar, corn syrup, salt, onion and garlic powders, natural flavor), Worcestershire sauce (distilled vinegar, caramel color, garlic powder, sugar, spices, anchovies, tamarind and natural flavor), water, high fructose corn syrup, apple cider vinegar, mustard (vinegar, selected mustard seed, salt, turmeric and spices), cane sugar, minced onion, onion powder, xanthan gum, salt, cayenne pepper, white pepper, , less than 1/20 of 1% potassium sorbate added as s preservative, chili powder, citric acid, EDTA, erythorbic acid and capsicum. Contains fish.